Derrick Jeter is 39 years old. Nine months ago he broke his ankle. His net worth is conservatively estimated at $125 million dollars. He is a first ballot Hall of Famer. The New York Yankees are 49-42 and 6 games out of the AL East lead. He is movie star handsome, respected by his peers, and adored by legions of Yankees, and even a few Red Sox, fans. Why go through a rehab stint when it would have been so much easier to call a press conference and call it a career? What is he thinking? Why not walk away before you’re pushed out? Ego? Stubborn pride? No. Like another New York legend, Frank Sinatra, Jeter is doing it his way. I have expounded on what makes Jeter special at one point or another during every Yankees game I have ever witnessed, and sometimes during Sportscenter or MLB Tonight highlights. Class. Leadership. Attention to detail. Commitment to team. Unwillingness to give up or give in. On the field he exemplifies what athletes should aspire to. Off the field too. The fact that A-Rod has played so many games next to Jeter and is still A-Rod says everything about the Yanks 3rd baseman you would ever not want to know. Two of my top three modern day athletes have retired this year. Brian Urlacher, by his own admission, lost his desire and because of the man he is chose to retire rather than hang around and sleepwalk through a season for a paycheck. Ray Lewis’ body gave up on him- too many Sundays of leaving it all on the field had left him with nothing more to give. Jeter can still play. And he still wants to. And he is with an organization and a manager that will allow him to play until he can’t anymore. That’s repect. That’s loyalty. And whether or not you like the Yankees you must admit that’s pretty rare in today’s sporting world. Would the Yankees let any player dictate the terms of their exit? Probably not. But Jeter, like a handful of sports legends, has earned the right. And when the Captain can’t help the team he’ll be gone. His way. And baseball won’t be the same for me. 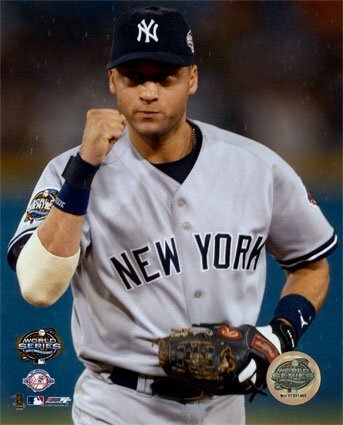 This entry was posted in Getting Old and tagged American League East, Brian Urlacher, Derek Jeter, Frank Sinatra, Jeter, New York, New York Yankee, New York Yankees, Ray Lewis, Yankees. Bookmark the permalink. My man stayed one year too long. Saddest thing I ever witnessed in sports was Mickey Mantle striking out on 3 pitches in the 1968 All Star game. If he had retired before the 1968 season he would have had a lifetime batting average of over .300, but he ended up at .298. He did have his highest salary year in 1968-$100,000. Yep, Pop, The Mick deserved better. Freakin’ Joe D, man.